Author's Note: Originally published in Issue 30 (Apr - Jun 1994) of the Hong Kong intellectual journal Intellectus, the following essay -- the first of a two-part instalment -- was written to commemorate the bicentennial of the death of Edward Gibbon (1737-1794), author of A History of the Decline and Fall of the Roman Empire. Click here for the second instalment. Readers who wish to read some specimens of Gibbon's masterpiece may visit either Dr. Zimmermann's web page (The "Best of" Edward Gibbon's Decline and Fall of the Roman Empire) or mine (Passages from Gibbon's Decline and Fall of the Roman Empire). "Good historians," wrote Horace Walpole, "are the most scarce of all writers, and no wonder! A good style is not very common; thorough information is still rare; and if these meet, what a chance that impartiality should be added to them!" The English historian Edward Gibbon, who died 200 years ago, did not quite meet the last test, but neither did his Roman predecessor Tacitus, who alone can stand with him among the world's supreme historians. Gibbon was born at Putney, Surrey, on 27th April, 1737, according to the Julian calendar, which England was still using then. When the Gregorian calendar was finally adopted in 1752, he celebrated his birthday on 8th May. Born into a family of rather good fortune, he was the oldest son of Edward Gibbon Sr. and Judith Porten, who died in 1747 of her seventh pregnancy. Apart from losing his mother at a tender age, Gibbon also witnessed the successive deaths of his siblings, for it was then common for children not to survive their infancy. Although he survived his infancy, he was weak and always sick during his childhood, so much so that he often had to interrupt his schooling to convalesce at home. There, the future scholar made much use of the well-stored library, eagerly reading anything which he could lay hands on. And when his father sent him, at age 15, to Magdalen College, Oxford, he "arrived with a stock of erudition that might have puzzled a doctor" (Gibbon, Memoirs of My Life, B. Radice, ed. , p. 73). The faculty members at 18th Century Oxford were all clergymen who taught and took for granted the Thirty-nine Articles of the Anglican Church. But Gibbon, precocious and forever inquisitive, frequently questioned his teachers on religious matters. To him, both history and the Bible seemed to justify not the Anglican but the Roman Church in its claim to a divine origin, and having read some controversial books and talked to a Roman Catholic student, he was converted to Catholicism, an act which was then technically considered high treason. Scandalized by his son's conversion, Gibbon Sr. sent the boy into exile in Lausanne, Switzerland, to be doctrinally corrected by a Calvinist minister, Daniel Pavilliard. There the boy stayed for almost five years (June 1753 - May 1758), during which he not only renounced his Catholicism as expected, but also mastered his French and Latin, felt and enjoyed the breezes of French rationalism that had blown into Lausanne, met Voltaire, read voraciously, participated actively in social gatherings, and fell in love with a beautiful and equally intelligent lass, Suzanne Curchord. It was the first and last love affair in his life, and it ended regretfully, since his father "would not hear of this strange alliance." Many years later, Gibbon summed up this adolescent misfortune in two well-balanced and oft-quoted sentences: "I sighed as a lover, I obeyed as a son" (Ibid., pp. 105 and 208). Gibbon returned to England on 5th May, 1758, only three days short of reaching majority. Between mid 1760 and late 1762, he and his father joined the Militia formed by the English gentry to prepare against the danger of French invasion during the Seven Years' War. When his term of service expired, Gibbon left home and began his 22-month Grand Tour of Europe, spending the first five months, from January to May 1763, in Paris. He next stayed in Lausanne for the succeeding eleven months, then crossed the Alps and visited the various cities of Italy (Turin, Milan, Florence, Pisa, etc.). Finally he arrived at Rome in early October 1764. 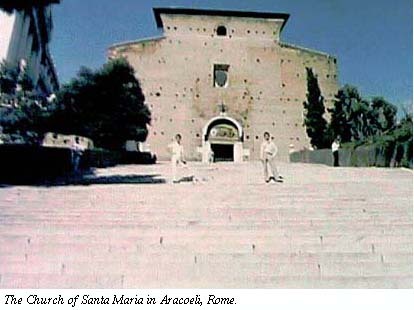 "It was at Rome, on the 15th of October 1764," Gibbon later recalled, "as I sat musing amid the ruins of the capitol, while the bare-footed friars were singing vespers in the temple of Jupiter [presently the Church of Santa Maria in Aracoeli], that the idea of writing the decline and fall of the city first started to my mind.... But my original plan was circumscribed to the decay of the City, rather than of the Empire" (Ibid., pp. 16 and 143). Modern scholars seriously doubt the authenticity of this account. Perhaps the scene at the Temple of Jupiter is another myth, just like the one concerning Newton and according to which an apple hit him on the head and inspired him to formulate his Theory of Gravitation? Let us not worry; in any case, we can be quite sure that strong emotions agitated Gibbon's mind when he first set foot in Rome and saw for the first time those ancient ruins of which he had previously read so much. The second and third volumes of his history were both published in 1781, and as well received as the former. In the same year, Gibbon was elected member for the borough of Lymington in Hampshire, soon after the meeting of the new parliament. But the government under the Prime Minister Lord North was now falling. Reorganisation ensued and the Board of Trade was abolished. With it our author "was stripped of a convenient salary after [he] had enjoyed it about three years" (Ibid., p. 164). He remained faithful to Lord North's coalition from motives of gratitude, but was never reinstated in any employment. There is, however, no reason to believe that he would have accepted any lucrative post, if its duties had trenched upon the time now devoted to his studies. Given these conditions, he contemplated moving to Lausanne, the city from which he had derived so much comfort and instruction in his youth, and the morals and manners of which agreed so much with his love of ease and independence. He wrote to George Deyverdun, a friend of his who now settled there. Deyverdun wrote back and welcomed him to Switzerland. In September, 1783, Gibbon, having disposed of all his effects except his library, left England and arrived at Lausanne after an absence of nearly twenty years. There, in a comfortable house, he wrote the last three volumes of his Decline and Fall, which were all published on 8th May, 1788, to coincide with his 51st birthday. The French Revolution of 1789 interfered with Gibbon's tranquillity in Switzerland. In January 1793, Louis XVI was guillotined and Revolutionary sentiments were voiced in the Swiss cantons. Partly to escape the French Revolutionary army which was approaching Lausanne, partly to seek English surgery on his swelling scrotum, and partly to comfort his friend Lord Sheffield on the death of his wife, Gibbon left for England on 9th May, 1793. Later the same year, he underwent a number of surgeries, but in January 1794, his condition worsened rapidly. He died in his sleep on the 16th of that month, at the age of 56. The Decline and Fall of the Roman Empire is perhaps the only Western historical work that is more than one hundred years old and yet continues to be read frequently by the non-specialised educated public. Why is this so? First, the greatness and tragical character of the subject catches the attention and arouses the imagination and sympathy of its reader, who finds himself at once introduced to a time most fondly wished for by Man, when most civilised people were peacefully united in "the period in the history of the world, during which the condition of the human race was most happy and prosperous" (Decline and Fall, Ch. 3). Yet, Man somehow lost this grace and now continuously wonders why. In an attempt to ascertain the reason, people turn to Gibbon for enlightenment. Second, for the Western Man in particular, there is here a unique fascination: for out of the ashes of the Western Roman Empire were born the modern nations of Europe, while out of the belated fall of the Eastern Roman Empire came sparks which lit Europe's beacon of humanism and science. Seen in this light, although the Decline and Fall concerns Rome, it is really an ancient history of Europe and European civilisation, and any Western reader is therefore bound to find in this work illumination regarding his origin and roots. Consisting of 71 chapters, 2136 paragraphs, some one million and a half words, and close to 8000 footnotes, the Decline and Fall encompasses a millennium and a half of history, covering not merely the Western Roman Empire from the days of the early emperors to its extinction in A.D. 476, but also the Eastern (Byzantine) Empire, which lasted for another thousand years until it was vanquished by the Turks in 1453. Spatially, the work covers three continents and ranges from the frozen wastes of Siberia to the cataracts of the Nile, from China and Mongolia to the Strait of Gibraltar. It even encompasses, within its asides, the New World of America and the antipodes of New Zealand. Reading the Decline and Fall, one cannot help but feel as if he were traveling in H. G. Wells' time machine, finding himself sometimes at the Forum of Rome in the 2nd Century, some other times in the forests of Germany in the 5th Century, yet some other times in the deserts of Arabia in the 7th Century. What led first to Rome's decline and ultimately to her fall? Gibbon discovers many causes, which he discusses in various parts of his work. For instance, the long period of peace and the uniform government of the Romans gradually extinguished the industry and creativeness of the people, as well as the military discipline and valour of the soldiers (Chs. 2 and 7); the indulgence in luxury, which originally remained confined to the nobles and residents of the Imperial Court, was later extended to the troops, totally corrupting their morals (Ch. 17); the enrolment of mercenary barbarians in the armies, which served to excuse the Roman themselves from military responsibilities, at the same time encouraged the barbarians within the Empire to grow in power and influence (Ch. 17); the multiplication of oppressive taxes was countered and evaded by the rich, who shifted the burden to the poor, who in turn also dodged them and fled to the woods and mountains to become Rome's rebels and robbers (Ch. 35). Notwithstanding the importance of these many contributing causes, Gibbon considers another two to be the most important and decisive: (1) the invasion of the barbarians, and (2) the growth of Christianity within the Empire. "I have described the triumph of barbarism and religion," he writes in the concluding chapter of his History. Every student of ancient Roman history would be familiar with the foreign enemies of the Roman Empire, most of whom were barbarians: the Goths, Lombards, Vandals, Alemannis, Huns, Persians, Turks, etc. As they had invaded Rome at one time or another, it is easy to appreciate their respective role in her fall. However, it is less easy to understand the role Christianity played as an accomplice. How was it possible that a religion whose humble founder preached love and peace and who later found himself gruesomely nailed to a cross contributed to Rome's collapse? Let us analyze this position of Gibbon in more detail. In Gibbon's view, Christianity made for the decline and fall of Rome by sapping the faith of the people in the official (pagan) religion, thereby undermining the state which that religion supported and blessed. To be sure, Gibbon is not blind to the fact that other cults and sects within the Empire were also competing with one another in their attempt to attract believers. As he admits, "Rome, the capital of a great monarchy, was incessantly filled with subjects and strangers from every part of the world, who all introduced and enjoyed the favourite superstitions of their native country" (Ibid., Ch. 2). However, Christianity was to be distinguished from the other flourishing sects in its claim to exclusivity, or in other words, in its claim that it alone held the key to "Truth" and to Heaven, and that all its competitors were vicious and damned. Moreover, as the early Christians believed in the imminent end of this world, they all put their thoughts in the "next" world. This other-worldly attitude proved most disastrous to the Empire during the barbarian invasions, since the Christians, instead of bearing arms to serve the state and the public good, diverted men from useful employments and encouraged them to concentrate on heavenly and private salvation. Needless to say, Gibbon's anti-Christian position aroused the fury of his Christian contemporaries. Reading Gibbon's chapters on the various aspects of Christianity -- its origin and growth; its institutions; its theology and theological discords; its heroes, heretics, and villains -- one cannot fail to be overwhelmed by his vast knowledge of the subject. This is all the more amazing if we note that despite being reconverted by Daniel Pavilliard to Protestantism, he actually lost faith in Christianity as he read more and more books on philosophy, foreign cultures, and religious controversies through the years. However, instead of showing indifference to a religion in which he no longer shared any enthusiasm, he went the opposite direction and read so many works of the theologians and church historians that his erudition could shame any Christian believer. As John Cardinal Newman confessed, "It is notorious that the English Church is destitute of an Ecclesiastical History; Gibbon is almost our sole authority for subjects as near the heart of a Christian as any can well be" ("Milman's View of Christianity," quoted in G. W. Bowersock et. al., eds. , p. 203). On another occasion, Cardinal Newman wrote, "It is melancholy to say it, but the chief, perhaps the only English writer who has any claim to be considered an ecclesiastical historian, is the unbeliever Gibbon" (quoted in J. W. Swain , p. 70). Gibbon's erudition in matters Christian is but a very small part of his scholarship. In his History, he quotes not only the Church Fathers where it is relevant, but also the historians, the biographers, the travelers, the geographers, the natural scientists, the life scientists, etc. -- in short, any expert whose opinions and discoveries in his own particular field may somehow lend weight and add authority to the Decline and Fall. He had keen interests in a great many fields of study, and kept books on subjects which could be as remote from history as ballet, bee-keeping, farce, and anatomy. According to his own estimation, his library at one time contained some 6000 to 7000 volumes (Memoirs, p. 172)! Like the Roman Emperor Gordianus II whom he depicted in Chapter 7, he kept books that "attested the variety of his inclinations", and they "were designed for use rather than ostentation." This is by no means a boastful recollection, but a fact well agreed by fellow historians. 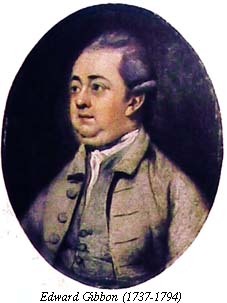 Thus, William Robertson, one of the three best known 18th Century English historians (the other two being David Hume and Gibbon himself), acknowledged that "I have traced Mr Gibbon in many of his quotations (for experience has taught me to suspect the accuracy of my brother penmen), and I find that he refers to no passage but what he has seen with his own eyes" (Ibid., p. 73). Similarly, David Hume praised him on "the depth of your matter [and] the extensiveness of your learning" (Ibid.). Finally, in the words of J. B. Bury, the English historian and classical scholar who had produced the best-known edition of Gibbon's Decline and Fall, "If we take into account the vast range of his work, his accuracy is amazing" (Decline and Fall, vol. 1, p. x). In short, what qualified Gibbon to be the historian of the Roman Empire was the simple fact that he knew more about it, and had thought more deeply about it, than anyone else. In all the years since the publication of his masterpiece, there has never been a lack of scholars of the Roman Empire, but no one has written a history on the decline and fall of Rome which is comparable in size, scholarship, reputation, and readership to Gibbon's. Despite the breadth of Gibbon's historical and geographical knowledge, his understanding of the meaning of history is surprisingly narrow. In Chapter 3 of the Decline and Fall, for example, he describes history as "indeed, little more than the register of the crimes, follies, and misfortune of mankind." Later, in Chapter 9, he writes that "Wars, and the administration of public affairs, are the principal subjects of history." Indeed, apart from the chapters on Christianity and Islam, the Decline and Fall deals mainly with the wars, crimes, and follies of the Romans: there is very little mention of the arts and architecture of the Roman Empire, nor is there any significant description of its economy, science, philosophy, and literature, etc. The ideal historiography, on the other hand, would seek to portray in each period the total complex of a nation's culture, institutions, and ways of life. Gibbon espouses no dogma of natural and inevitable progress in history, for he is not a historicist. In fact, he is an anti-historicist: he knows that although human passions are timeless, circumstances are never the same. And while he well recognises that "history... undertakes to record the transaction of the past, for the instruction of future ages" (Decline and Fall, Ch. 16), and therefore that the politics of Rome might illuminate those of England, it would be a distortion to infer that Gibbon crudely integrates the Roman Empire and the British, or more generally, that he sees history as a kind of Nietzschean "eternal return". No; for Gibbon, history is not an answer book, nor even a compendium of social "laws". Rather, it is an endless succession of engagements with a past in which the dramatis personae themselves were never fully able to fathom, control, and command events. Till the reign of Severus, the virtue and even the good sense of the emperors had been distinguished by their real or affected reverence for the senate. From the love, or the ostentation, of learning, [George of Cappadocia] collected a valuable library of history, rhetoric, philosophy, and theology. Ignorant, or careless, of the impending danger, Chrysostom indulged his zeal, or perhaps his resentment. Was it the emperors' real or affected reverence for the senate that distinguished their virtue and good sense? Was it the love, or only the ostentation, of learning which prompted George of Cappadocia to collect a valuable library? Was Saint John Chrysostom ignorant or careless of his impending danger? And what did he indulge in, his zeal or his resentment? In all these questions, we may never know the answer; but perhaps all the alternatives were equally present, for Man's most important actions usually proceed from mixed and dubious motives -- virtue and vice are unequally distributed, but hardly ever mutually exclusive. So by using language to open up a multiplication of meanings, Gibbon wants the reader to be unsettled and become aware of the illusion that history contains meanings and solutions. In this regard, he anticipates Sir Karl Popper's position as set forth in the latter's Open Society and Its Enemies. Although Gibbon judges events in the history of Rome with the serenity, detachment, and seeming objectivity of an English scholar, it is important to note that as the author of his History, he feels as a Roman, thinks as a Roman, and writes as a Roman. His Rome is neither Italian nor Christian, but simply Roman, or more precisely, Republican Roman. It is specifically for this reason that he expresses the strongest opposition to Christianity and the Byzantine Empire, since he considers the morals and manners of both institutions to be debilitating in nature, and therefore in exact opposition to those of Republican Rome. He may be the last citizen of ancient Rome, and another of his biographers most fittingly calls him "the noblest Roman" (E. J. Oliver , Ch. 15). BOWERSOCK, G. W., CLIVE, John, and GRAUBARD, Stephen R., eds. : Edward Gibbon and the Decline and Fall of the Roman Empire. Cambridge, Massachusetts: Harvard University Press. CRADDOCK, Patricia : Young Edward Gibbon, Gentleman of Letters. Baltimore: The Johns Hopkins University Press. ---------- : Edward Gibbon, Luminous Historian 1772 - 1794. Baltimore: The Johns Hopkins University Press. DURANT, Will, and DURANT, Ariel : The Story of Civilization. Vol. X: Rousseau and Revolution. New York: Simon and Schuster. GIBBON, Edward (J. B. Bury, ed.) : A History of the Decline and Fall of the Roman Empire in 6 volumes. Norwalk, Connecticut: The Easton Press. ---------- (Betty Radice, ed.) : Memoirs of My Life. London: Penguin. HO, Yue-Ching Eugene : "Edward Gibbon and his Decline and Fall of the Roman Empire." Written in Chinese and published in the 27th March 1994 issue of the local newspaper Hong Kong Economic Journal. ---------- : Notes for the Eight Lectures on "Edward Gibbon and his Decline and Fall of the Roman Empire", given to members of the Hong Kong Institute of Economic Science. LOW, D. M. : Edward Gibbon, 1737 - 1794. London: Chatto & Windus. OLIVER, E. J. : Gibbon and Rome. London: Sheed and Ward Ltd.
PORTER, Roy : Edward Gibbon: Making History. London: Weidenfeld and Nicolson. SWAIN, Joseph W. : Edward Gibbon the Historian. London: MacMillan. This page has been accessed 137448 times since the counter was last reset. It was last modified Monday, 19-Apr-2004 14:25:15 EDT.